If you have decided that you want to be a certified public accountant in South Dakota, the profession can offer you job security and opportunities for advancement. CPAs are well-respected professionals, whose services are needed by businesses of all sizes, ranging from small, local businesses to Fortune 500 corporations. CPAs are also in demand by educational and governmental employers. While becoming a CPA will require that you complete a rigorous education and the other requirements for obtaining licensure, doing so is within your ability. Here are the steps that you will need to complete to become a CPA in South Dakota. If you took courses at an online or two-year college, they will be accepted as long as the school has regional accreditation. If you graduated from a college that was not accredited, your courses will still be accepted if you were later accepted into an accredited graduate program. Your courses may still be accepted if your school was unaccredited when you attended but is accredited when you apply for your CPA certificate as long as the requirements at the time that you attended and at the time of your application were largely the same. The SDBOA may also accept your courses from an unaccredited undergraduate program if you completed 15 semester hours at an institution that was accredited with nine of the hours that were completed in accounting after you obtained your Bachelor's degree. Finally, if you graduated from a college or university overseas, you will need to have the program evaluated to determine whether or not your courses will be deemed to be acceptable. If you are 100 days or less of completing your required accounting education, you are able to register to take the South Dakota Uniform CPA Exam. You can do this by downloading the application from the SDBOA's website and completing it. Along with your application, you will need to submit your application fee. Your fee must be paid by a certified check or a money order from a U.S. bank. Make your check or money order out to the South Dakota Board of Accountancy for the exam sections that you are taking. If you have a disability that requires accommodations during your exam, you will also need to submit the Americans with Disabilities Act accommodation form. Finally, you will also need to send your sealed, official transcripts along with your other materials to the SDBOA. Once your application has been reviewed and approved by the SDBOA, you will be sent a payment coupon from the National Association of State Boards of Accountancy. You will then send your payments with this coupon to the NASBA. The NASBA will send you a notice in the mail to schedule your exam after it receives your payment. You can schedule your exam date by going to Prometric's website. Your exam must be scheduled no more than one year after the date of your notice to schedule your exam. Save your notice and bring it with you on the day of your exam. After you have taken your exam, your results will be mailed to you. Once you have passed the Uniform CPA Exam's sections within a period of time that lasts for 18 months or less, you will need to take the professional ethics course that is offered by the American Institute of CPAs. You are required to take this exam when you are within three months or 90 days of when you will or have completed the required experience. 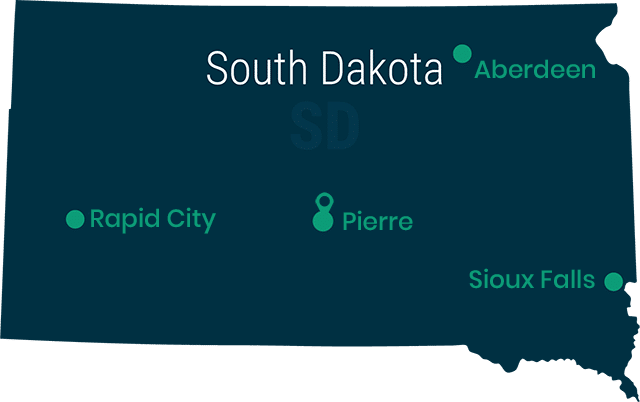 South Dakota requires that you complete 2,000 hours of work experience practicing as an accountant while you are under the supervision of a CPA in the state. If you will be writing reports about financial statements, 375 of the hours must include auditing, review and compilation experience. Your experience must be obtained over a time period that lasts from one to three years, and the work must be completed in public accounting, with the government, in industry or in academia. When you have gained the required experience, you will need to fill out the certificate of your experience and have the supervising CPA sign it. This certificate will be submitted when you apply for your CPA license. Once you have completed all of the required education and experience and have passed your CPA exam, you can apply for your South Dakota CPA license. You can get the application for an initial certificate on the SDBOA website. Complete the application and submit it together with your application fee of $50. You will need to mail your application and fee to the SDBOA at 301 E. 14th St., Ste. 200, Sioux Falls, South Dakota 57104. The SDBOA will send your license to you via postal mail. Your continuing education credits are current. To get your CPA license in South Dakota, fill out and submit the authorization for interstate exchange of information and the application for a reciprocal certificate. If you are currently licensed in Hong Kong, Mexico, Canada, Australia, New Zealand or Ireland, you can apply for international reciprocity. To obtain your South Dakota license, you will need to take the international exam through the National Associations of Boards of Accountancy. After you have taken and passed the exam, you will then need to apply for your South Dakota CPA license. If you are licensed in a different country other than those that are previously listed, you will need to have your education evaluated and then take the Uniform CPA Exam. Your application will be reviewed on an individual basis. In South Dakota, a CPA license is renewed on a tri-annual basis. You will be required to complete 120 hours of continuing professional education credits during each three-year period. In any specific year, the minimum number of CPE credits that must be completed is 20. In a three-year period, you may have a maximum of 60 credits in teaching accounting courses or a maximum of 24 credits in motivational or behavioral courses. If you have received your CPA license within one year of when it is scheduled to be renewed, you will not have any CPE requirements for that period. Each year runs from July 1 to June 30 for calculating your CPE hours. For all of your CPE credit courses, you are required to retain records of them for a minimum of four years. Your records should include details of the name of the course, its location, a description, the date it occurred and the address and name of the CPA sponsor. You will also need to include information about how many CPE credits you earned by taking the course. For applications for renewal that are submitted on time, you will need to pay a fee of $50. Late applications have a fee of $100. If the CPE provider is one that is listed in the National Registry, you can complete your renewal application online. If your CPE sponsor is not listed on the National Registry, you will need to complete the non-sponsor CPE verification form and submit it to the SDBOA. Once you have become a licensed CPA in South Dakota, it is a good idea for you to join professional organizations, including the South Dakota Society of CPAs and the American Institute of CPAs. These organizations offer a wealth of resources, including CPE opportunities, networking and professional development. While becoming a certified public accountant in South Dakota will take a lot of work, you have the ability to secure it. Make sure that you complete the education and experience requirements, take your exam and apply for your license. After you are licensed, keep your CPA certificate current by taking the required number of CPE credits each year. When you complete everything that is required of you, you will be able to enjoy a career in a highly respected profession.